Bubble RPG Combat on the Go. Lightslinger Heroes is a game developed by indie developers Skyborne Games (a group of, I believe, four friends) and is available on iOS and Android. As mentioned before, it’s a strategic bubble slinging game that incorporates RPG elements into its gameplay. 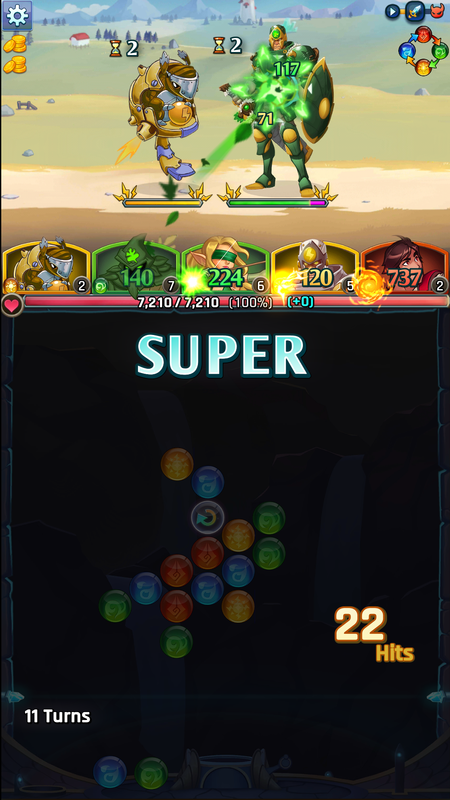 Your goal is to match at least three of the same colored bubbles together, which will power up your corresponding heroes. At the end of your turn (which consists of throwing three bubbles), the power you’ve amassed is unleashed on your foes. The more bubbles you connect, the higher your damage output. It’s a neat take on a game that really needs a fresh idea like this. But there’s much more to the bubble slinging than just matching three of the same colors. Should you eliminate a string of colors that bridges two sections of bubbles together, the lower half of the bubbles that are no longer attached to anything also become incorporated into your attack. Additionally, there’s a bubble that works as a sort of wildcard orb that can match with any color combination and adds statuses to your attack (like if you match it with green bubbles, you earn healing; likewise, orange bubbles reflect damage; etc.). 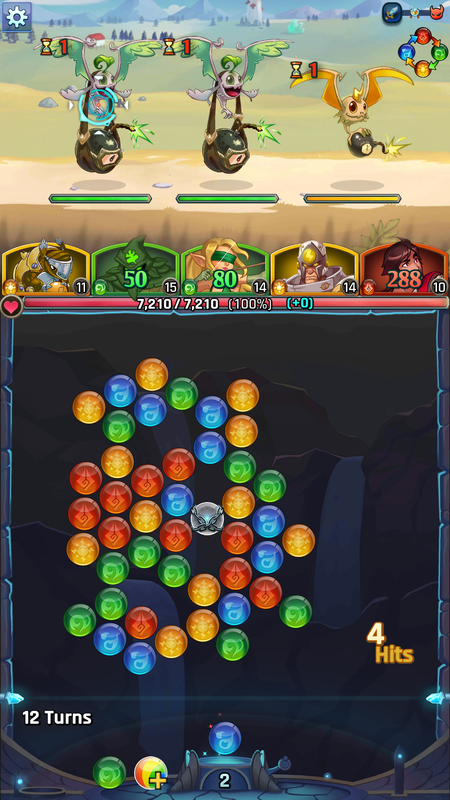 These extra bubbles, along with the obstacles and portals/warps that will either aid or harm your slinging, create a very strategic late game series of battles. The game does become a lot tougher despite your amazing bubble slinging skills. Like most RPGs, your characters can level up, power up (if you collect enough character shards, you can increase their “power”), and gear up. By doing so, you’ll increase damage output, defense, HP, skills, the likelihood someone will recruit your hero to use in their own missions (it’s always nice to have a high level friend to help you through the tougher battles). Sound in Lightslinger Heroes features some pretty solid fantasy music. I particularly enjoyed the peaceful song that played as I opened the app, and the battle music isn’t too shabby, either. The sounds of combat are fine, and everything works well in total. Likewise, visuals in Lightslinger Heroes are simple but effective. Your party has their images on the bottom of your battle screen, while the enemies take over the top (each battle has two+ waves of enemies for you to battle against, and as you eliminate your current foes, the next wave appears). The center segment of the screen is largely usurped by the bubbles and bubble sling, allowing you maximum coverage to effectively toss your bubbles. 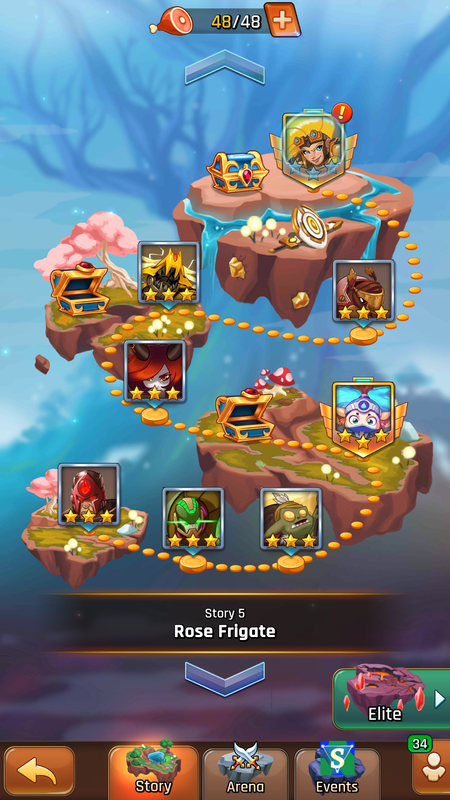 On the whole, Lightslinger Heroes offers a lot of free content that should continue to grow. Live events should continue to keep any dead space filled, and the arena provides ample challenges, especially if you’re lower leveled. Quests allow you to earn extra rewards and will have you trying for 3 stars on each mission, so the content there is solid, too. Obviously, most every free-to-play mobile game, there’s a plethora of in game purchases you can make. I never saw the need to buy anything; simple grinding and the free summons got me what I needed in not too much time, so purchasing items seems like a personal preference. If you’re an RPG fan and enjoy bubble slinging games, or if you enjoy a decent mobile game with a challenge, Lightslinger Heroes is definitely worthy of a download. Advertising seems limited to optional videos to gain free items, and micro transactions are available but not necessary. There really isn’t any story to latch to, and the gameplay, while fresh and innovative, doesn’t provide much variation. Still, as a f2p mobile game, Lightslinger Heroes does a superb job creating an absorbing game and fresh approach to a tired style. Previous ArticleBitCultures Plays God of War pt. 3 | 50 Shades of "Jason!"